Manually built by hand each one. A reflection of your business carved into Web 2.0 stone. Our Web 2.0 blogs are the best you can get! We build a collection of powerful web 2 backlinks to your site, fanpage or anything you want. You get very high quality, high ranking and ever lasting contextual in content backlinks from all the best top most popular web 2 blogs. You get better rankings because of them, more traffic, improved rankings and earnings! Web 2.0 blogs are very sought after as they can help web masters to achieve better rankings by having a good strong Web 2.0 backlink profile. Just like you would need to have a lot of social signals and social bookmarking links. Web 2.0 blogs and sites can all be used as a Google ranking factor. And time after time we see Positive Results from building web 2 campaigns on new & established sites. That includes thin sites and über niche sites of any kind, category or nature. These aren't your typical Web 2.0 blogs though. And this is no typical run-of-the-mill Web 2.0 blog building service either. The web 2 sites we use are Hand Picked. And Hand Made when we create them, we imagine we are you and never cut corners. We go the extra mile and make sure it's all done properly and with oomph! With gusto, with care and precision. Every part of your blogs profiles will be filled in, the blog home pages will all have unique descriptions, content and images that reflect your site, your business, your sites links and contact details and links to your sites social profiles etc. All with all unique content and images and videos. Oh yes, we go all in with our high quality Web 2.0 Blog Building Service. One you will be proud of. One you will want your customers to see. One you will be successful with. We understand that this is YOUR business we are working on here. And we understand that each of them is a reflection of YOUR business. Your Web 2.0 blogs will be a place of first contact and will contain your sites logo, images, contact details, Twitter page, Facebook page links etc like a proper Web 2.0 blog does. Web 2.0 blogs are the latest internet website technologies that let people use the site in a way as to curate and share content, ideas and just about anything they want from articles to videos to pictures and more for free. These types of sites and blogs are very useful for a lot of reasons, to a lot of people. People use them to find work or employees, find ideas and inspiration and more. And they rank highly on their own in the search engines. This means it's usually sometimes easier to rank an article and some keywords much quicker and much higher using Web2 blogs. As they are often returned as first page results, it could be your web2 blog that ranks high and your site they visit and spend their money on. But you got to have them first! Of all the website promotion and marketing services we've provided over the years, it's been Web 2.0 Blogs that have been the most popular choice as well as the most effective means and solution to achieving faster better search engine results in the results pages SERPS. They've also been one of the best ways to build brand awareness and get some juicy dofollow anchor text back links. Of course, PR no longer flow although it still remains. But PA and DA link juice are built all the time! 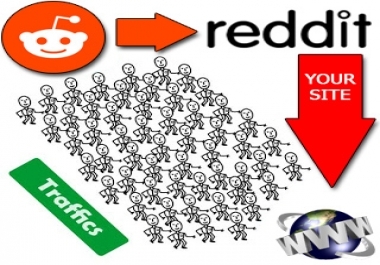 Get real live traffic and link juice from the top Internet trusted Social Networking sites, Web 2.0 Blogs, Wikis and other Web 2.0 sources. We use over 25+ Web 2.0 sites and you may even choose which ones to use! We'll provide you with a full list when you order that you can choose from. What other service does that!? First we create your blogs using your keywords as the blog urls and titles etc as closely as we can. Then we edit/modify them ensuring all pages like profile bio/avatar etc is set and change Blog settings etc. Next we will create you a high quality news broadcast style video that can be posted to your YouTube Channel which we'll use on the Web 2.0's for you. Meanwhile we will write a new articles of 1000 words minimum and manually spin this by hand using TBS by hand. We are professionals at this and will do a high quality job only of spinning this by hand its not some sloppy auto job! Did I mention we do it by hand? We then add the article with images and video to the blogs home pages with links to your site using your given keywords and a mix of general keywords and unique images on each one, and randomly link to one of your other Web 2.0's also. We will always include your sites main details in all the Web 2's and post the article in the blog section where available. We will kickstart your Web 2's blogs SEO by sending a mix of social signals to each of them from the top social networking sites using Facebook shares, Twitter tweets/retweets, Pins/Repins etc. Are you the owner of a New site? Established site? Or Authority site? We only go as fast as it would be reasonable for one person to do per day on their own. Whether you own a new site, a more established site or an authority site already, are Web 2.0 blogs are 100% safe and friendly for your site guaranteed. Do You Want to Attract More Customers? Improve Your Local SEO? Our Web 2.0 blogs are tailored for your needs and around your keywords. We will identify some of the best local search phrases for your sites business location within the content on the blog such as in the title or description etc. We have different sized plans available for all sized sites and budgets. ✮ Creation of 5 minimum or x amount of Web 2.0 blogs based on your requirements. ✮ Creation of unique fresh researched high quality article. ✮ Professional high quality manual article spinning by professional/experienced hands. ✮ Creation of news worthy, high quality video for your channel. 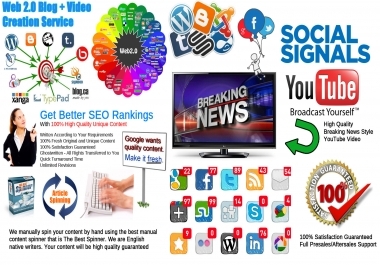 ✮ Mixed Social Shares/Signals for each blog to kickstart its SEO. ✮ Full work report in Spreadsheet Format Upon Completion. 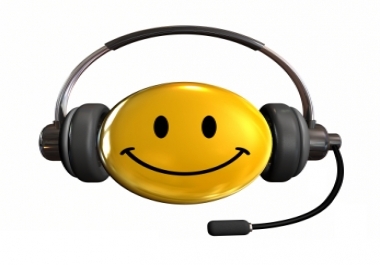 ✮ 100% Satisfaction Customer Service Guaranteed! Remember, we are professionals and have been creating amazing Web 2.0 blogs and videos for years and will provide you with a high quality service. All of our work is manually done by hand by people with real personalities and real moods, most good, some bad, but we always get the work done as advertised and that's what matters! We will require some details from you to get started such as your site and the main keyword or two that you are targeting that we can create the sites/content/video on. It's worth a thousand words! We will create a very appealing 1000 word article related to your niche or can write anything you want. We manually spin this by hand using love and care! We will create a video in a news announcement style format. You will love it! We can post this to your Channel after or for you. We will post it onto your Web 2.0 blogs. We will use unique content and images on each Web 2. 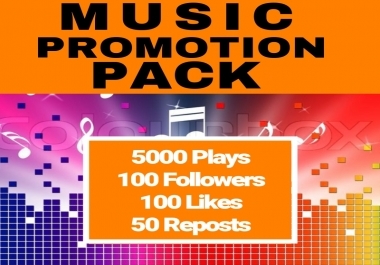 We will build 1000 mixed social signals to each in the form of likes, shares, tweets, +1's etc. We will send you a full report of all the work when complete with links, login details, content used etc in spreadsheet format. How Long Does it Take to Complete the Work? From a few days to a whole week or month. You can choose to go slow or go fast with it. By default, we'll go at a speed of 1 per day, so if you ordered 5 blogs, it will take us at least 5 days, 10 blogs 10 days, 20 blogs 20 days etc (plus the time to create the video and spin the article and so on. How Many Sites/Keywords Can I Use? There are no real restrictions but usually its for one to two urls and you can use multiple keywords up to 25 if you want we will randomly use them for you. What Sites Can You Use with the Service? We will work with virtually any sites in any niche accept Adult niche. Your site must be family friendly and safe for work. Can I Use my Own Images/Videos? Yes, we can use them on your web 2 blogs for you along with unique images as well. Please supply them when ordering else we'll handle that for you no problem! If you have any more questions please feel free to ask. Order now and receive free eBook: Web 2.0 and Social Media for Business. Whether you're a beginner with Web 2.0 or an expert already, you'll find the Web 2.0 and Social Media for Business an interesting and knowledgeable read. Learn the ins and outs and different parts of Web 2.0 and how to use them all to your leverage and success. Put together by professionals in many leagues a truly resourceful Web 2.0 bible FREE! Orders completed within 14 days.